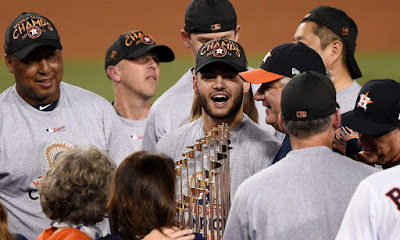 Houston Astros starting pitcher, Lance McCullers, who played a key role in the playoffs in helping the Astros win the 2017 World Series, was interviewed on the Sports Radio 610 Morning Radio show called, MAD Radio, with hosts Mike Meltser and Seth Payne. It was a fantastic interview and McCullers gave great insight in the Astros season and his personal accomplishments in a very personable way as he always does. He related how there was so much pressure, especially after Hurricane Harvey, that had the Astros playing with and for the people of Houston-hoping to give them a boost and inspiration with a World Series win. That is why when they finally accomplished this great feat, while there was of course, great joy, there was also a great relief he felt. He must have felt like a big weight was lifted of his [and the team's] shoulders. Here is just a small clip from this interview [that I hope you will listen to all of] where Lance relates the importance the Astros felt for winning it for Houston. Note: In the interview, the Jose Lance mentions he was honoring was his long time friend, Jose Fernandez, Miami Marlins pitcher who died in a boating accident. To hear the entire interview, please click here.